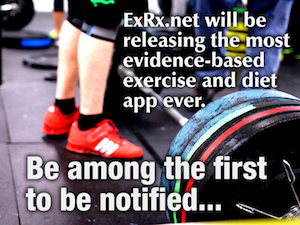 If you need more structure to your diet than the guidelines outlined on ExRx, you can develop your diet using certain tools on ExRx.net. Whether your goal is to gain muscle, lower body fat, or both, you need a way to accurately monitor your progress. Looking at yourself in the mirror or assessing how you fit in your jeans is too subjective and dependent on extraneous variables other than your actual body composition. Although factors other than diet often affect continued strength gains, strength gains should also be monitored. This is particularly relevant if your goal is to lower body fat while maintaining strength. Have your body composition measured along with an accurate body weight every month. A fitness club or nearby college with a PE department typically offers this service. Ideally, you would be best suited to find an experienced tester who would be available consistently for at least the next several months. Along with a body composition test, an accurate weight is required to estimate changes of fat and lean body weight. Weigh yourself the same time of day, every time you have a body composition test. Also, use the same scale every time, weigh with no or minimum clothing, and have the same tester test you each time. The data can be entered and assessed using the Body Composition Calculator . After the first body composition, choose one of the following methods to put together your initial base diet. These portions can be changed later according your test results. Estimate your caloric needs using the Calorie Requirement Calculator . Design your diet using the estimated calorie output and guidelines on the Food Exchange Calculator . Print out all food exchange lists at the top of Main Menu B of ExRx Diet & Nutrition. Print and use the Daily Activity and Food Exchange Form to plan the times you will exercise and eat. On this form, also plan when you will eat the exchanges from the Food Exchange Calculator using the first several Dietary Guidelines . Print, copy, and use the Food Exchange Journal to record your daily consumption until you have developed a consistent pattern to your diet. See our Food Image Library for menu ideas. If you do not find a food on the lists, guess on the most appropriate exchange category, note the calories per exchange, look up the calories per serving on the label or other source, and calculate the quantity of food per exchange. If you decide to decrease your carbohydrates, consider experimenting with a moderately low level initially and adjust according to your energy requirements. Take some time to experiment with the ideal amount of carbohydrates. Your body can take some time to adjust. If decreasing calories from the diet make the smallest changes necessary to elicit a change (eg. -250 kcal to -500 kcal), this will minimize your metabolism slowing down too much, making it easier for future progress. Also see Weight Management section. A regimented diet with periodic body composition tests to monitor your progress can help you adjust your diet and workout accordingly. The trick is to get enough calories to put on muscle, but not so much that you gain fat. See Muscle Mass Tips . Do the best you can the first few days. Weigh or measure all food until you are able to estimate portions accurately. It may take some time to familiarize yourself with the exchanges and to make other adjustments to your diet. It is important to be fairly consistent with your calories. Try to make up for a deficit or surplus in calories within the next day only up to 500 calories. Others may choose to alter and monitor their carbohydrate intake, but not lowering to the point they begin to lose strength or are unable to maintain intensity for their sports training. After a month on this diet, measure changes in your body composition. Analyze if you need to make any changes to your exercise program or diet. Don't fret if the changes to your body composition were not as great as you had expected. Learning from your failures as well as your successes will allow you to better understand what works best for you. Also see Interpreting Changes in Fitness Test Results . Make the necessary adjustments and retest the following month. Continue to make the necessary changes to both your diet or exercise program until you are making adequate progress. Initially, this structured diet program takes considerable effort. The most common complaint I hear, even on diets designed for weight loss is "I can't possibly eat all this food". Persevere, your body will adapt. After some time using the food exchanges and measuring your foods, your diet will become your second nature. At this point, you may decide you do not need to keep a written record nor measure everything you eat.